1. How to register Sidify Apple Music Converter for Mac? 7. How to improve the output quality? 8. How to fix the problem that the output files have several short breaks of silence when played back? 9. How to fix the problem that 1 or 2 seconds of a random song from iTunes library adds to the converted audio? 10. How to automatically store the output audio into Artist / Album folders? 11. Whether the metadata can be kept after conversion? 12. How to keep chapters when converting an Audiobook file? 13. How to solve the problem of "Conversion Failed" when converting iTunes music with Sidify? 14. How to make Sidify work faster under MacOS X 10.13 or above? 15. How to fix no sound issue on Mac after using Sidify Apple Music Converter? 16. I encounter some problems that I can't find in FAQ. How can I get technical support? How to register Sidify Apple Music Converter for Mac? Click menu bar and click Sidify Apple Music Converter, choose Registration in the drop-down list, you will get the register window. Or directly click the red word "Unregistered" to open the registration window. And then copy and paste your Email address and Code into the registration popup dialog. Note: The license information is case sensitive. And, please do not add blank at the beginning or the end of the word. There are two reasons for invalid code. Second, blank spaces are accidentally added while filling in the registration information. Please mind that license information is case-sensitive. Do not enter any extra blank space to the Email address and license code. If you have checked that you are running the right program and follow the above tips but still get the error message, please contact our support team via support@sidify.com for help. Important Notes: Since Sep. 22nd, 2016, Sidify‘s products adopt a new registration mechanism in the latest version. 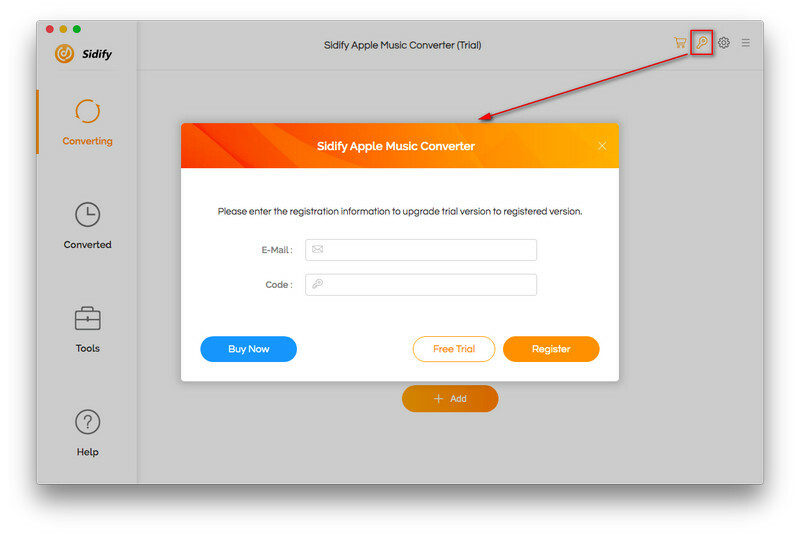 New users who purchased Sidify Apple Music Converter for Mac are required to register the program with Email address and registration code. For old users, it's still available to register with registration name and registration code. Sidify Apple Music Converter can convert any audio that can be played in iTunes, including Apple Music tracks, iTunes M4P music, iTunes audiobooks, and Audible audiobooks. Now, Sidify Apple Music Converter can convert audio files to MP3, AAC, FLAC and WAV format. b. Go to your home directory –> Music –> iTunes and delete "iTunes Music Library.xml"
Please set the output format as MP3, AAC, FLAC or WAV and slow down the converting speed to 1X for a try. To customize output settings, please open program preferences by clicking Menu bar > Sidify Apple Music Converter > Preferences or directly clicking Setting button on the main interface. Then, set output format, and lower down the conversion speed to 1X in the pop-up setting window. If you are still unsatisfied with the output quality, please contact us at support@sidify.com for further help. How to fix the problem that 1 or 2 seconds of a random song from iTunes library adds to the converted audio? Once choosing MP3 or AAC as output format, the metadata (including title, artist, album, art cover and track number) will be kept by default. How to keep chapters when converting an Audiobook file? If you want to keep the original chapter in the audiobooks, please select AAC as output format. For more details, please refer to tutorial: How to Convert iTunes Audiobooks to AAC with chapters kept. Please check whether there is any external audio device connected with your computer including USB, Wi-Fi, Airplay, Bluetooth and HDMI, etc. If it is, please disconnect them and retry. For Mac OSX 10.13 users, please check whether you have installed other similar music converters. If it is, please try to delete the driver file under "/Library/Audio/Plug-Ins/HAL/MMAudio Device.driver", then open terminal, enter this command "sudo killall coreaudiod" and relaunch Sidify for a try. How to make Sidify work faster under MacOS X 10.13 or above? Good news comes: the latest version of Sidify Apple Music Converter allows users to convert Apple Music songs at 20x speed under MacOS 10.13. You can click on "How to Convert Apple Music at Faster Speed under MacOS 10.13" for reference. How to fix no sound issue on Mac after using Sidify Apple Music Converter? Some users responded that there was no sound from Mac laptop speakers after downloading and using Sidify. Now you can manage to fix this sound issue by following How to Fix No Sound Issue on Mac after Using Sidify. Please contact our support team at support@sidify.com and provide us with detailed info like Mac OS, iTunes version, and program log files for analysis. Tips: How to find the two log files of Sidify? Just find the menu button on the upper right corner and click on File > Show Log File, A window which contains the log files would pop up. They are iTunes.log and Application.log.